It’s Thanksgiving time, so gobble up! Make these creative turkey pretzels just in time to impress your friends and family for the holidays. Place your choice of cookies on a tray with wax paper. Leave room for the placement of the pretzel sticks. Drizzle chocolate onto your chocolate cookie as your candy corn glue. Heat your chocolate chips in a microwavable glass, one that is tall enough to dip the pretzels in. Microwave for 30 seconds, then stir and repeat. Once melted, leave 2-3 minutes of cooling time. Dip your pretzel sticks about 2/3 of the way into the melted chocolate, coating it completely. Shake off excess if desired. Lay your dipped pretzel sticks onto the cookies. 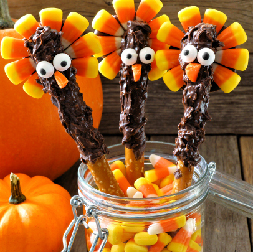 Then, attach candy corn in the shape of a fan to create the feathers. Cool in the refrigerator for 10 min to ensure the candy sets. Place small amount of chocolate onto the pretzel to adhere the eyes and beak with your chosen candies. To create the waddle under the beak, microwave your red candy for 45 seconds in a plastic sandwich bag. After, knead and make sure it is smoothed and melted. Clip a corner of the bag, and pipe the waddle under each beak of your turkey pretzels (for frosting use, pipe the waddle in a similar fashion). Place pretzels back in the refrigerator for another 10 min to solidify all your candy.